Good Choice Reading: FREE eBook Novella: Only Us by Susan Mallery! FREE eBook Novella: Only Us by Susan Mallery! 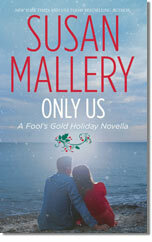 There is still time to get your FREE copy of Susan Mallery's Only Us: A Fool's Gold Holiday Novella! I've already downloaded it and read it! I loved it! Review to come soon! What are you waiting for?!?!? Hurry! Get your copy!